Since February 18, 2014, I’ve written and published over 250 blog posts every Monday morning without fail. The goal was to document my clay studio life, express artistic ideas, gain valuable feedback from my readers and reveal a bit of myself along the way. Each one was vetted and edited by my husband, Barry before publication. This morning’s blog post will mark the end of the once a week diaries I plan to write. I do intend to blog when I’ve got studio news or artistic content to share, just not every Monday morning. Here are a few of the pieces I created in 2018. Several of them came from suggestions you made! I’ve been away from new clay-making projects for the last week or two. The holidays, family visits, pottery sales and a deep cleansing of accumulated papers, paraphernalia, and collected ‘stuff ‘have been a priority. Going through, culling (my mother’s word) what’s still important, throwing out and reorganizing the bins filled with memories has been cathartic, revealing, comforting, and emotional. Some stuff is easy to toss, but not everything. See that little clay sculpture in the upper right-hand corner of this photo? That’s one of my first clay creations from the early 1960’s. It’s been a great exercise of discovery, reacquaintance, and reassurance of the 62 year old person I am today. I’ve laughed, I’ve shed a tear or two, and I’ve narrowed down our family history into letters written and received, artwork, some collected memorabilia, and photographs. 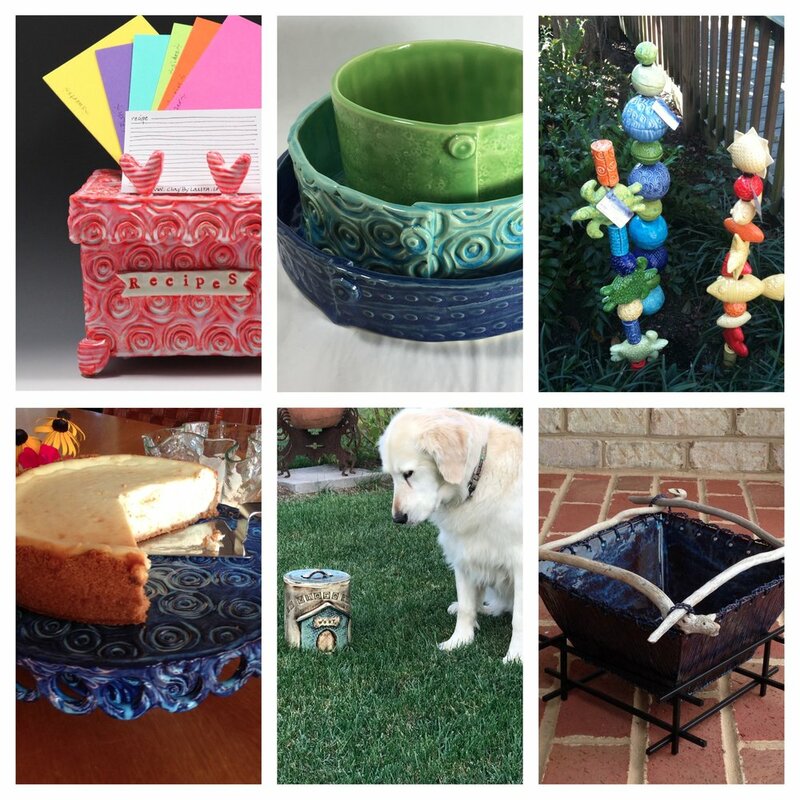 Over the years, I’ve made many types of pottery for daily use, special occasions and simply to help decorate. These are some of my favorites. Writing has been and still is important to me. It is one of several tools I use to express myself. Pottery, knitting, sewing, polymer clay, and other 3D crafting all contribute to my creative body of work and make me the artist I call myself today. As this new year evolves, I plan to explore more and all of these ways of self-expression to scratch the creative itch I wake up with every day. Commissions have been a fantastic way for me to stretch my artistic muscle! Thank you. Thank you for reading my weekly blog entries. Thank you for sending me feedback. Thank you for telling me how a particular post was meaningful to you. Thank you for purchasing my art. Thank you for suggesting new ideas to explore. Thank you for being my friend. Thank you for listening — I think that’s the basic need every artist has. Do you remember these? I made these ‘LUVBOTS’ for my valentines in February 2014. They were the subject of one of my very first blog entries. As always, I love to hear your feedback. Click the photo to send me a message! "Thanks for your time, this time; until next time, so long for just a while."